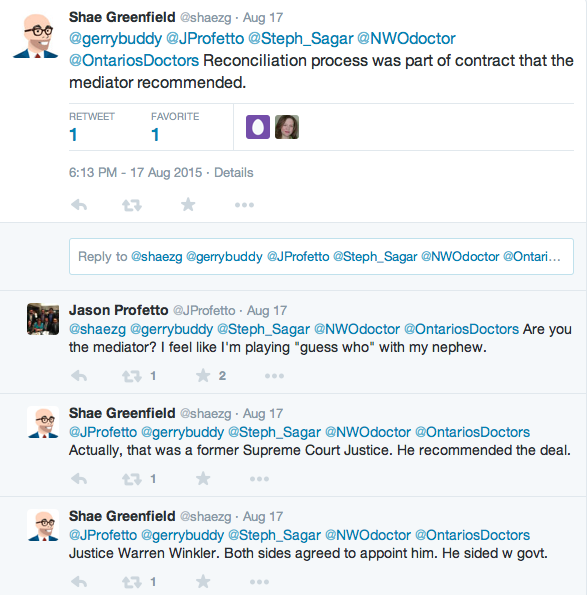 Back in January when I started my blog, one of my first articles was a product of my frustration with Ontario Health Minister Eric Hoskins, and what I felt was the deceptive and dishonest spin he was putting on the failed negotiations between the government and Ontario’s physicians. Eight months later, physicians are still without a contract with significant clawbacks looming this winter, and intentionally misleading comments from the Ministry of Health have once again drawn my ire. First, a quick summary on where we are currently at. In 2012, the OMA and the Ministry agreed to a Representation Rights Agreement that outlined how future negotiations would proceed. In January 2015, following a Negotiation and Facilitation phase, and the Conciliation phase, the OMA rejected the Ministry’s final proposal calling for steep cuts to physician compensation. As all phases of the negotiation had been fulfilled, the Ministry saw it appropriate to unilaterally impose cuts to all physician fees, as well as impose a global clawback on all physician payments above an arbitrary budget that they had set (See here for a explanation of the absurdity of this clawback mechanism). Perhaps the OMA was naïve in 2012 to enter into an agreement with the Ministry that would allow the Ministry to unilaterally impose deep cuts to physicians, but I suspect the OMA felt that they had a trusting and productive relationship with the Ministry. At the OMA annual meeting in May, it was unanimously agreed upon that the OMA would demand a binding dispute mechanism from the Ministry. To anyone with a modicum of decency, this would be the only fair way to resolve this stalemate, to allow a neutral third party to determine a fair contract moving forward. It is now August, the Ministry has not accepted a binding dispute mechanism, and this matter has been referred to a special committee of the bilateral Physician Services Committee for consideration. Sadly, the Ministry is intentionally slow playing this issue, and in the meantime is putting the health care of millions of Ontarians in jeopardy. So what has me so upset? 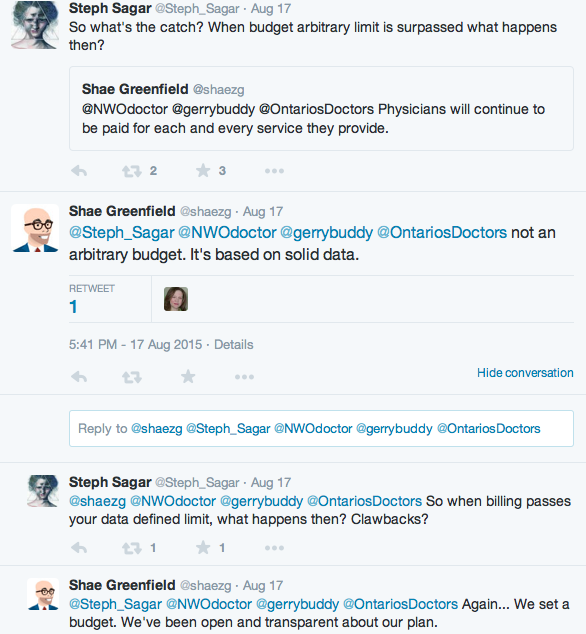 First, the Ministry has still given physicians no details on when exactly the global clawbacks will be occurring. Late in 2015? Early 2016? When have we gone over their arbitrary cap? Ontario physicians essentially have a dark cloud of clawbacks hanging over our heads (in addition to the already 5+% cut on every fee since 2012), with the prospect of multiple months of zero income while our expenses still need to be paid. Instead of working towards a resolution, and instead of attempting to repair their relationship with physicians, the Ministry has continued to parrot the same falsehoods that they have used since January. 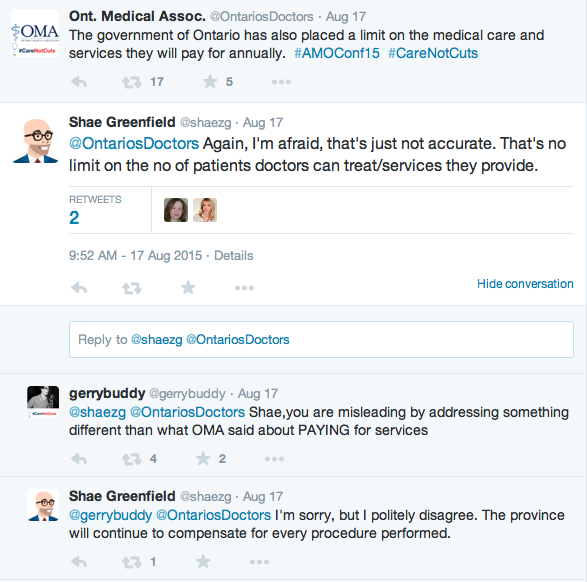 Yesterday on Twitter, Ontario government press secretary Shae Greenfield gave us a glimpse into how the Ministry will continue to confuse the public through the fall and winter months. It is clear what the OMA is stating. The government has put a limit on what they will pay for. It’s a global budget. This is not in dispute. But here Mr. Greenfield ramps up the doublespeak. Yes, of course doctors technically have no limit on the number of services we can provide. I could see a MILLION patients in 2015! No limits! How is that relevant at all to the fact that the government is only paying for a fixed budget, regardless of patient demand or need? Adding 700 physicians a year is easy when you’re going to make other physicians pay for it. With their plan, they could add thousands of physicians, with the same overall cap, and physicians would be subsidizing their colleagues. They truly don’t see how this is a recipe for disaster. 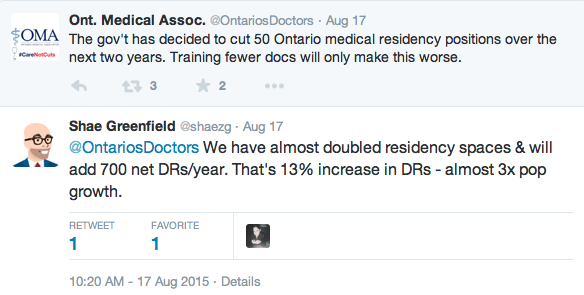 (I’m going to save my criticism of their residency cuts for another day). At this point I was about to spontaneously combust from frustration. This was a clever phrasing that someone in the Ministry hatched, to declare that physicians will “be compensated for every service they provide”. Being compensated one dollar for an appendectomy would satisfy their intentionally deceiving criteria here. He repeated this exact refrain at least half a dozen times. I won’t bore you with the repetition. Again, if they laid out their plan for clawbacks, where is it? What is he talking about? Alas, finally we get to the Ministry’s favourite talking point, Justice Winkler. The final phase of the negotiations ended with Reconciliation, led by Justice Winkler. In any attempted explanation of their imposed unilateral cuts, the government has fallen back on the explanation that “we’re only implementing what Justice Winkler recommended”. Which is comically untrue. 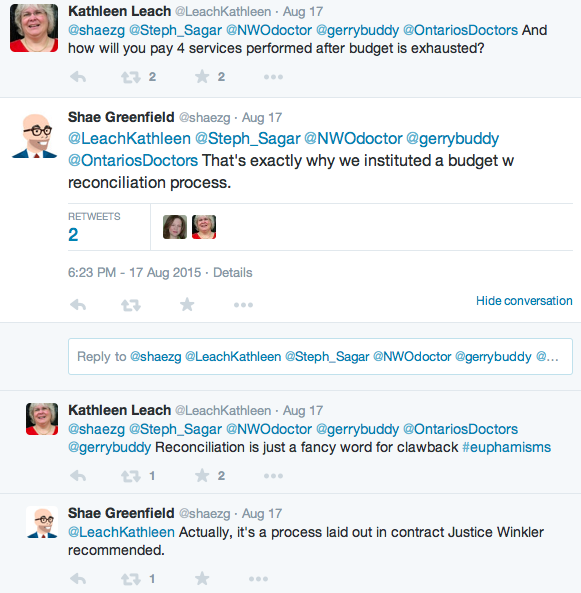 Mr. Greenfield actually linked to Justice Winkler’s report as support for his argument. Here’s the report. Find me where Justice Winkler endorses any concept of clawbacks beyond an arbitrary global cap, or find me where he outlines in detail a “reconciliation process”. It’s not there. The Ministry sought to address the outstanding gap between the Parties by responding in two areas: savings and the cost of practice – both in the third year. The Ministry tabled its final position (the “Ministry’s Proposal”) on the last day of the Conciliation. The proposal was for a three-year term. It provided for savings in the amount agreed upon by the Parties in years one and two. Importantly, in the third year, the Ministry conceded its position for a further savings of $32.7 million. Moreover, it offered a one-time lump-sum contribution in year three to physicians’ cost of practice in the amount of $117 million (1% of the PSB). The Ministry included in its proposal the agreed upon Task Force and the Minister’s Roundtable. No mention of a reconciliation process, no mention of a fixed global budget from which clawbacks would be imposed. Also, falling back on the opinion of a conciliator is inappropriate, as his responsibility as conciliator was to bring the parties close to an agreement, not to serve a final judgement. Having an arbitrator decide on an appropriate contract would be the best solution, but the government is currently resisting this. More importantly, Justice Winkler made it very clear that “without systemic changes to the health care system, the Parties seemed to be on a collision course so that a Physician Services Agreement , at some point in the future, may not be achievable.” To seek solutions for this problem. He made recommendations for a Task Force on the Future of Physician Services in Ontario (the “Task Force”) and the Minister’s Roundtable on Health System Transformation (the “Minister’s Roundtable”). Eight months later, and not a word from government about any progress on these committees. Absolutely no urgency whatsoever. And eventually if the committees are ever formed, they will provide a voluminous report that will likely collect dust. And there you have it. The Ministry is treating this like a game. A game that they feel they have already won, packed up, and gone home. They got the result they wanted, through whatever means necessary, and don’t care about the fact that years of relationships built between government and physicians have disintegrated. Relationships that have strengthened aspects of health care across the province. I don’t expect much from our government, but I do expect honesty and a fair process. That is certainly not happening right now, and I hope that the public is getting a clear glimpse into how this government is treating physicians. Because years from now, when Ontarians are wondering where all of their physicians went, we can point to the government’s behaviour in 2015. This entry was posted in Uncategorized on August 19, 2015 by supermarioelia. Speaking as a patient I feel that there are some issues. With a chronic health problem it is in my best interests to pay the extra fee my Dr charges though I see her only a few times a year. I am on her roster so she receives a capitation sum for me. Usually when I try to make an appointment I am directed to seeing a locum, where I have been told 30% of the fee goes to the Dr of record. Then there’s the 10% bonus for me being over 65. And yet she treats me for 1 problem per visit and does not even mention my chronic illness. This doesn’t seem patient centered. So instead of obliterating FHOs….